Last Thursday Scott Lowe of Rockland almost had one ticket too many. After purchasing lottery tickets Home Spirits on Columbia Road in Hanover, he discovered a $50,000 win. 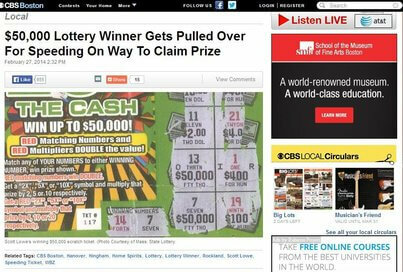 Excited by his lottery success, he sped off (literally) towards lottery headquarters to make his claim. An officer stopped him for speeding. Luckily , the officer was persuaded not to give him a traffic ticket when he explained the reason for his rush. He got off with a mere verbal warning. Beth Bresnahan, the Lottery’s Executive Director validated Scott’s lottery success story. Lucky to get one (lottery) ticket, and even more lucky not to receive a traffic ticket.